A-T have used their innovative rectangular diaphragm concept to come up with this new instrument mic. Read our exclusive review! Blue are known for their innovative mic designs, and now they’ve applied that originality to their first set of studio headphones. PA veterans Cerwin-Vega expand their popular P-series with the launch of this compact yet powerful active speaker. Although control surfaces may not ‘add’ to your sound, they can certainly make working with audio an easier and more pleasant experience. But with so many different models on offer, it pays to read up on them before you commit your hard-earned money. Few compact wedges can boast the same quality, versatility and robustness as this uncompromising speaker from Dynacord. In their new PX series of monitors, Fostex have chosen to use DSP to provide a range of useful configuration options. It’s neither cheap nor perfect — but there are still reasons to love this device! Does DM307 live up to Heavyocity’s reputation for seriously good beat creation tools? A follow up to Dark Ambient - Volume 2, now even darker! Latvian mic makers JZ have applied their unusual design approach to this hand-held vocal mic. Does it stand up to the competition? Acustica Audio’s Nebula software is brimful of potential, and this course should help you realise a bit more of it. 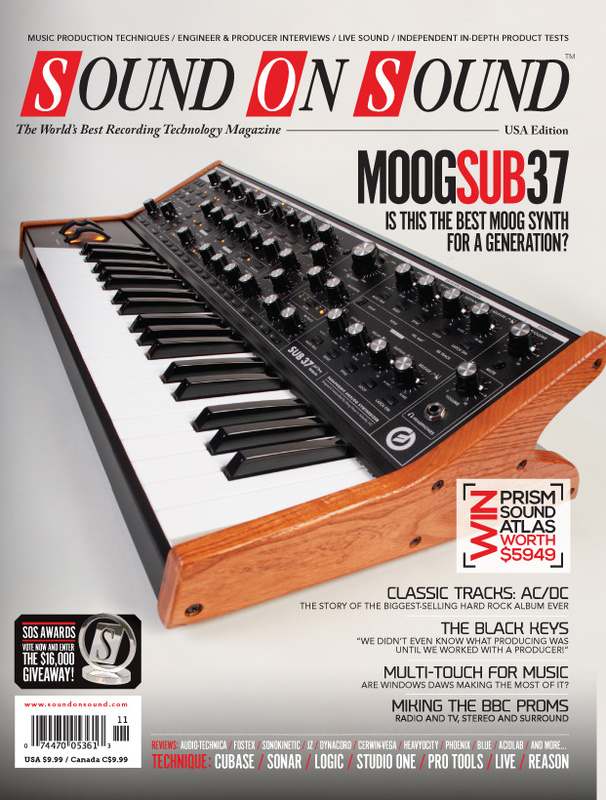 Moog’s latest synth, the Sub 37, sees the company return to the form that made their reputation back in the 1970s. So many Leslie speaker emulators are mere approximations. Could authenticity lurk in these tiny boxes? For the first time, fans of Phoenix gear can assemble a full recording channel. Real reels are a thing of the past — but not all tape emulation comes in software form. Sonokinetic go epic with a grandiose 12/8-time orchestral phrase library. Hollywood’s Sunset Sound studios celebrated their 50th anniversary with this incarnation of their legendary mic preamp. Sunset Sound S1P: Audio Examples. Polish speaker company Sveda might be new kids on the block, but their Dapo monitors can hang tough with the established competition. Discover the power of Logic Pro X’s advanced automation features. Broadcasting every single Promenade Concert is a huge challenge for the BBC’s sound teams — especially as radio and TV have completely different requirements! There’s lots to get to grips with in the new version of Reason. From guitar amps to gates, Pro Tools’ bundled plug-ins are more versatile than you might think. Preset to accompany the article. These files accompany Pro Tools Technique article in the November 2014 issue. Cubase has all the tools you need to add vocal glitching effects to your pop or EDM tracks. These files accompany Cubase Technique article in the November 2014 issue. Tom Petty’s first US number one album was mixed almost entirely without hardware — and with only two plug-ins! This page contains a directory of all media pages that hold the associated media for November 2014. Arc Pilot: When you’re talking about bass, it’s definitely possible to have too much of a good thing! MIDI control between Live and Reason now works in both directions. Properly archiving your finished projects is vital. Here’s how to do it in Studio One. Steven James Adams: Our engineer shows that there’s nothing wrong with living-room recordings if you approach them in the right way. Team SOS travel to Sheffield, to help one man in his quest to realise his lofty studio ambitions. We examine the production of some recent hits to help you brush up on your listening skills. Lilly Wood, Taylor Swift, George Ezra and our Classic Mix is Mariah Carey 'Without You'. Get an even vocal level in Sonar without resorting to compression. For anyone who is just starting out with home recording, they could do a lot worse than spend a few weeks recording and mixing. The Black Keys have built a career on a shared love of studio experimentation. Everyone’s patience has limits — but as a professional, you should never reach them. Housed in an old cinema in Stockholm, Atlantis Studios is a very special place even by the standards of our Studio File series. Media content for the November 2014 issue.